Enjoy the beauty of a hardscaped custom designed and installed waterfall in your yard or place of business. Find your inspiration in nature with Amicalola Falls, Niagara Falls, and other natural falls. A hardscaped waterfall will provide a tranquil and peaceful environment right in the heart of the city. According to Home and Garden Television , “The soothing sight and sound of bubbling water can add ambiance to your outdoor living space and mask unwanted noise.” With metro Atlanta growing and thriving, it is nice to have a place that provides peace and quite. Take a look at the inspirational pictures of these hardscaped waterfalls; they have visual and audio perks that will be perfect in your own tranquil garden. Contact us after you find your inspiration. 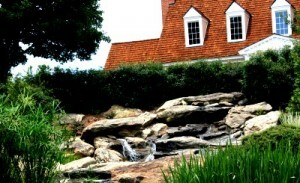 We’ll detail a custom hardscape waterfall plan for you.